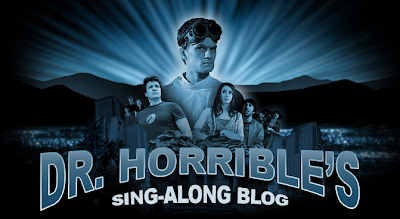 The DVD is loaded with special features as expected: making-of featurette, Evil League of Evil (ELE) applications and musical commentary from Joss and his co-writers (his brothers Jed and Zack Whedon and Maurissa Tancharoen) and of course the stars—Felicia Day, Neil Patrick Harris, Simon Helberg and Nathan Fillion. Yes, you read that correctly, even the commentary is a musical. “Commentary! The Musical” is the most painstaking and exhausting piece of whimsey I have ever mistaken for a good idea,” wrote Joss today on Whedonesque.“It has nearly twice as much music as Dr. Horrible itself — since you can’t really talk that much during a commentary musical or it sounds like a regular commentary. Αμπελοφιλοσοφησε ο Dr Horrible στις 12/01/2008 05:27:00 μ.μ. Το κομμάτι είναι πραγματικά ασύλληπτο !! όταν το είχα πρώτο- ακούσει είχα ανατριχιάσει ! 2 Δεκεμβρίου 2008 - 4:54 μ.μ.